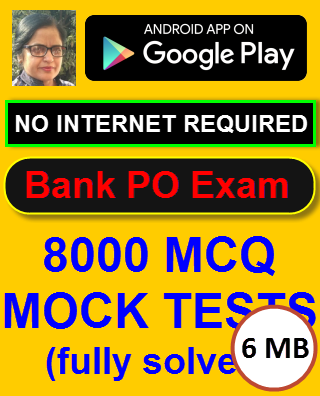 More than 8000 Questions for those who are preparing for various Bank PO and Clerical Exams, GATE Exam, SSB, SSC Exams and other mental ability exams like NTSE. 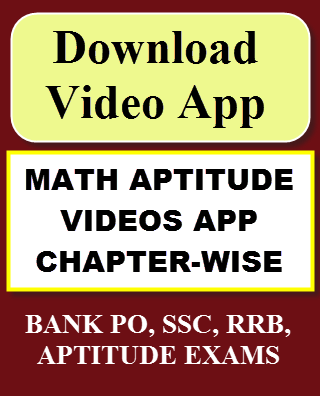 Aptitude, Verbal, Non-Verbal, Mental Ability questions for bank exams, placement preparation, National Talent Search Exam(NTSE), NDA and CDS exams, Civil Services CSAT Exam, GATE Exam, UGC NET, Allahabad Bank PO Exam, Andhra Bank PO Exam, IBPS CWE Exam, Gramin Bank and all exams that test a candidate's mental ability. I have segregated various questions on the basis of topics. These topics are common to most of the exams in India. If you are preparing for an exam, then you will spot these in the syllabus of that exam. So you can straightway take a topic out of your syllabus and prepare for it here. Questions of similar type have been compiled together. The only way to succeed in these exams is by practicing questions of similar type and improve upon your weak areas. We have collected the syllabi for various exams that test a candidate's mental ability and aptitude. If you are preparing for one of these exams then you can immediately check the requirements of that exam, and also whether our aptitude questions will meet your requirements. This is the relevant syllabus for SSC Exam for reasoning and quantitative portions. The above questions and android apps will help you prepare for this exam because they cover this syllabus completely. Please refer the detailed notification at their website for complete syllabus. This is an extract from one of the recent notifications given by SSC. This should give you a rough idea of the types of questions they ask. Reasoning: It would include questions of both verbal andnon-verbal type. This component may include questions on analogies, similarities anddifferences, space visualization, spatial orientation, problem solving, analysis, judgment, decision making, visual memory, discrimination, observation, relationship concepts,arithmetical reasoning and figural classification, arithmetic number series, non-verbalseries, coding and decoding, statement conclusion, syllogistic reasoning etc. The topicsare, Semantic Analogy, Symbolic/Number Analogy, Figural Analogy, Semantic Classification, Symbolic/Number Classification, Figural Classification, Semantic Series,Number Series, Figural Series, Problem Solving, Word Building, Coding and de-coding,Numerical Operations, symbolic Operations, Trends, Space Orientation, SpaceVisualization, Venn Diagrams, Drawing inferences, Punched hole/pattern -folding and unfolding, Figural Pattern folding and completion, Indexing, Address matching, Date andcity matching, Classification of centre codes/roll numbers, Small and Capitalletters/numbers coding, decoding and classification, Embedded Figures, Criticalthinking, Emotional Intelligence, Social Intelligence, Other sub-topics, if any. Quantitative:The questions will be designed to test the ability of appropriateuse of numbers and number sense of the candidate. The scope of the test will becomputation of whole numbers, decimals ,fractions and relationships between numbers,Percentage. Ratio and Proportion, Square rots, Averages, Interest, Profit and Los,Discount, Partnership Business, Mixture and Allegation, Time and distance, Time andWork, Basic algebraic identities of School Algebra and Elementary surds, Graphs of LinearEquations, Triangle and its various kinds of centers, Congruence and similarity oftriangles, Circle and its chords, tangents, angles subtended by chords of a circle,common tangents to two or more circles, Triangle, Quadrilaterals, Regular Polygons ,Circle, Right Prism, Right Circular Cone, Right Circular Cylinder, Sphere, Hemispheres,Rectangular Parallelepiped, Regular Right Pyramid with triangular or square base,Trigonometric ratio, Degree and Radian Measures, Standard Identities, Complementaryangles, Heights and Distances, Histogram, Frequency polygon, Bar diagram and Pie chart. This is the relevant syllabus for IBPS Exam for reasoning and quantitative portions. The above questions and android apps will help you prepare for this exam because they cover this syllabus completely. Please refer the detailed notification at their website for complete syllabus. Reasoning: Number series, Letter and symbol series, Statement and argument, Logical Reasoning problems, Alphabet test, Passage and conclusions, Blood relations, Direction sense test, Input output, Coding-decoding, Number ranking, Making judgments etc, Making series / analogy, Classification, Series test, Odd figures, Miscellaneous test etc. Looking for Info on IBPS Exams? This is the relevant syllabus for SBI PO Exam for reasoning and quantitative portions. The above questions and android apps will help you prepare for this exam because they cover this syllabus completely. Please refer the detailed notification at their website for complete syllabus. Reasoning: Analogy, Coding and decoding, Blood relations, Sitting arrangements, Series completion, syllogisms, Decision making, Statement reasoning. Data Integration: line graphs, bar graphs, pie charts, Tabulation. Quantitative:Number system, Simplifications, Roots and Averages, Surds and Indices, Percentages, Profit and Loss, Ratio and Proportion, Partner ship, Chain rule, Time and work, Pipes and Cisterns, Time and Distances, Problems on trains, Boats and streams, Allegation and mixtures, Simple Interest, Compound interest, Stocks and Shares, clocks and algorithms, mensuration, Volume and surface area, permutations and combinations, heights and distances. This is the relevant syllabus for Civil Services CSAT Exam for reasoning and quantitative portions. The above questions and android apps will help you prepare for this exam because they cover this syllabus completely. Please refer the detailed notification at their website for complete syllabus. Reasoning: Focus on comprehension reasoning, Venn diagrams, number series, coding and de-coding, problem solving techniques, statement and conclusion type question, arithmetic reasoning, arithmetical number series, non-verbal series, syllogistic reasoning, seating arrangements, decision making, input and output logical reasoning. Question form non verbal reasoning may ask in the exam. Quantitative:Question will be asked from simplification, number series, quadratic equations average, percentage, time and work, area, profit and loss, simple and compound interested, time and speed, investment, hcf, lcm, problem on ages, bar graph, pictorial graph, pie chart. Date interpretation in the section which has to be focused. This is the relevant syllabus for HDFC Exam for reasoning and quantitative portions. The above questions and android apps will help you prepare for this exam because they cover this syllabus completely. Please refer the detailed notification at their website for complete syllabus. Reasoning: Everything related to reasoning questions as is asked in various bank exams. Numerical Ability: Same as is for IBPS, and Probationary Officers Exams. This is the relevant syllabus for GATE Exam for reasoning and quantitative portions. The above questions and android apps will help you prepare for this exam because they cover this syllabus completely. Please refer the detailed notification at their website for complete syllabus. Verbal Ability: English grammar, sentence completion, verbal analogies, word groups, instructions, critical reasoning and verbal deduction. Numerical Ability: Numerical computation, numerical estimation, numerical reasoning and data interpretation. This is the relevant syllabus for ICICI Bank Exam for reasoning and quantitative portions. The above questions and android apps will help you prepare for this exam because they cover this syllabus completely. Please refer the detailed notification at their website for complete syllabus. Reasoning Verbal: Number Series, Alphabet Series, Test of Direction Sense, Coding-Decoding, Number Ranking, Arithmetical Reasoning, Problem on Age Calculation, Blood Relations, Analogy, Decision Making etc. This is the relevant syllabus for CAT Exam for reasoning and quantitative portions. The above questions and android apps will help you prepare for this exam because they cover this syllabus completely. Please refer the detailed notification at their website for complete syllabus. This is the relevant syllabus for NTSE Exam for reasoning and quantitative portions. The above questions and android apps will help you prepare for this exam because they cover this syllabus completely. Please refer the detailed notification at their website for complete syllabus. About NTSE Exam:The National Talent Search Examination is conducted for students studying at the Class X level. The examination consists of tests, namely Mental Ability Test (MAT) and Scholastic Aptitude Test (SAT). The items in the MAT and SAT are multiple choice questions. Each question has four alternatives. The candidate has to select one correct answer from the given alternatives and mark its number in the answer-sheet as per instructions given on the answer sheet. Each correct answer carries one mark. Thus, the total score of a candidate in a test is equal to the number of questions answered correctly by him/her. Mental Ability Test:This test is given to the candidates to judge their power of reasoning, ability to think, ability to judge, evaluate or discriminate, ability to visualize in the space, spatial orientation, etc. A variety of questions, for example: analogies, classification, series, pattern perception, hidden figures, coding decoding, block assembly, problem solving etc. are used for this purpose.